Merle Wood & Associates is pleased to have the FORE ACES yacht for sale. As the 7th hull in the Talaria series from Hinckley, FORE ACES accommodates 4 guests in 2 staterooms. This classic picnic boat of legendary pedigree features a roomy cockpit with built-in seating and loose teak chairs. Upon entrance through the sliding glass doors, her interior boasts a U-shaped, neutral-toned built-in sofa and table for semi-al fresco meals on the main deck when the doors are kept open. Two wooden leather chairs to port are separated by a small built-in end table on which to rest drinks. Large windows enhance the feeling of spaciousness. Having the FORE ACES yacht for sale demonstrates both the diversity and range of what we offer here at Merle Wood & Associates. We highly recommend seeing FORE ACES in person so that you can fully appreciate her level of maintenance, fit and finish. Forward on the main deck, the bridge features 2 captain’s chairs and is faced with oversized, raked windows for excellent visibility. 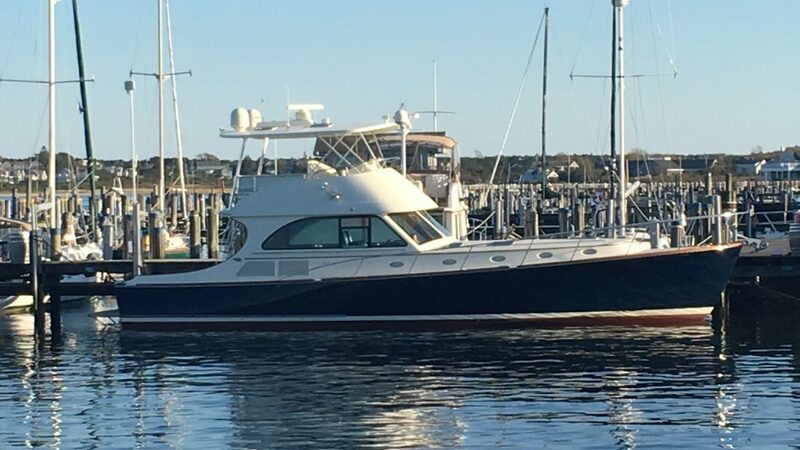 The FORE ACES yacht for sale features a well-kept galley equipped with all the makings of a great kitchen, including a wine fridge under the sink. We are offering the FORE ACES yacht for sale with a neutral-toned master stateroom that faces forward and features a well-appointed en suite bathroom, as well as a desk and chair at which to read or conduct business. A comfortable twin stateroom to starboard features the same superior wood treatment as the rest of the yacht. Having had her most recent refit in 2017, her main engines and waterjet drives have been maintained by the same technicians, year after year, ensuring consistency in her upkeep. All soft furnishings have been replaced with no expenses spared, and her interior woodwork is in pristine condition. Reliable power is by 2 MAN V-12 inboard diesel engines, at 1,360hp each. She has a maximum speed of 36 knots and a cruising speed of 26 knots, with a fuel capacity of 1,200 gallons (4,542 liters). For additional information, read the full FORE ACES yacht specs or view the FORE ACES yacht price and details. For information about the FORE ACES yacht for sale, or for expert knowledge from a qualified yacht broker, simply contact the luxury yacht brokerage firm of Merle Wood & Associates for assistance.